Reaching out and checking in - Work ... Uncaged. This is the final post related to the 1 key to successful telecommuting and I think of it as “icing on the cake”. Let’s assume you’ve got the communication down when it comes to One on One meetings, Email engagement, and Daily Updates. With all that in place you should be in an excellent position with respect to your visibility across the team. In other words, everyone should be fully aware that you are contributing and producing at an excellent level. That’s great, but there are likely still some lingering concerns. In my experience that’s often due to distance or a lack of camaraderie. It can be more difficult to really get to know others and for others to get a great feel for you. Much of this will resolve over time and with consistent behavior. In terms of getting to a more personal level, it generally just takes longer than when you see people face to face on a daily basis. I’ve found that this can be accelerated by reaching out. In part that can be done by asking questions when you’re stuck on something. I’m sure we’ve all been in situations where describing a problem we are vexed by and just talking it out with someone will lead to the answer. Seeking the assistance of someone on the team also makes them feel good. Most people embrace the opportunity to help when asked. They get to show off what they know or how they do things. I’ll admit that I often chase the thrill of figuring it out for myself. I often need to remind myself that I’m likely just wasting time and I should simply ask some of the smart people I work with. I’ve never been turned down. Sometimes I get the answer quickly and other times I have a great back and forth exchange that helps me come up with great ideas to try and develops my relationship with that person. On the flip side you should also make sure you offer to help when possible. If you are like most people, including myself, you’ll get something out of being viewed as the expert. Ultimately, it’s really about being part of a team. Share the knowledge and everyone will be better off. Beyond the technical there are many other ways to reach out and build a relationship when remote. I tend to be pretty private, but occasionally it’s worth sharing some things in the chat room. For example, when the kids had a fun event, or when some crazy weather moved through, or the latest micro brew I tried. It’s not necessary to go into a lot of details. People will strike up a conversation if it tickles their fancy. It’s also not necessary to do this on a daily basis. The occasional shared item will be more meaningful than telling everyone about the daily weather. It should go without saying that engaging in a brief chat when others share is also a great way to reciprocate. 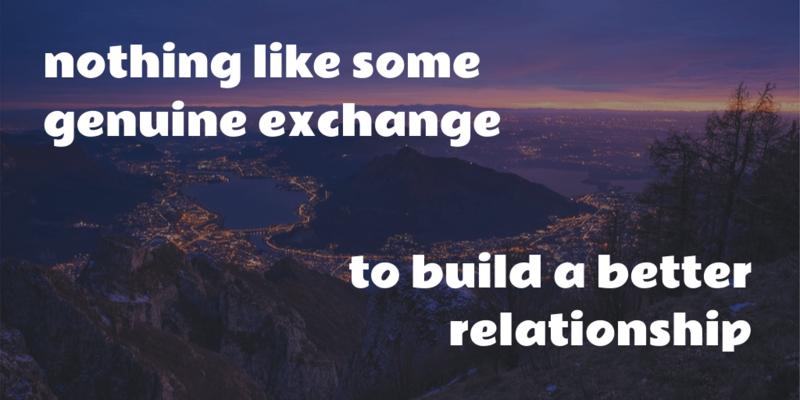 There is really nothing like some genuine exchange, be it work related or fun, to build a better relationship. When working remotely you just have to pay attention to the opportunities a little more.